Dental bridges are used to secure replacement teeth, enabling smiles marred by missing teeth to be restored to their optimal strength and beauty. Bridges may be attached to teeth on either side of a gap, to just one adjacent tooth and a dental implant, or secured to a wire framework. Abutment teeth are covered with dental crowns to help prevent damage to healthy tooth enamel. In the Washington D.C. dental office of Dr. Marlin, dental bridges are constructed from high noble gold alloys, porcelain, or a combination of these materials. Our bridges are fabricated onsite in our private dental lab where quality control and precise details are overseen by Dr. Marlin and our experienced lab technicians. Fast, reliable, and effective, the dental bridges offered by Dr. Marlin can have a profound impact on the strength and appearance of your smile. Call us today to schedule a consultation and learn more. 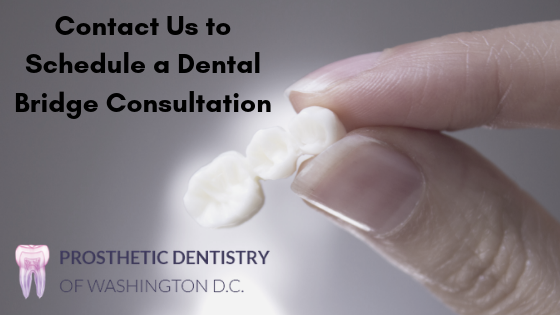 To schedule a dental bridge consultation at Prosthetic Dentistry of Washington D.C., please call 202-851-8016 today. It is important to remember that a dental bridge can only hold replacement teeth above the gums and, while this can preserve bite tension, prevent adjacent tooth slippage, and restore beauty to the smile, it will not prevent jaw shrinkage. Dental implants are the only method of tooth replacement that can prevent structural changes to the jaw brought about by mineral loss. The procedure usually takes three appointments to complete. At the first appointment, Dr. Marlin will prepare the teeth on either side of the gap by removing a portion of the enamel and dentin to allow room for a dental crown to be placed over them. Since the dental bridge must be fabricated very precisely to ensure the correct bite and to match the opposing tooth, impressions of the teeth are taken and sent to our In-House Lab where the bridge will be fabricated. A Temporary bridge will be placed to protect the teeth and provide function and aesthetics while the permanent bridge is being made in the dental laboratory. At the second visit, the gold alloy framework will be tried in and custom fitted to the teeth and gingival (gums). At the last visit, your temporary bridge will be removed, and the permanent bridge will be fitted, adjusted and custom colored to match your natural teeth. It is then cemented in place. Depending on the complexity of your case, multiple visits may be required for the most precise result by checking the fit of the ceramic or gold alloy framework, by analyzing the bite, and by making shade match enhancements. Implant supported bridges function exactly like traditional bridges but are affixed to implants on one or both sides of the gap. As with a traditional bridge, dental crowns will be used to cover the implant and produce a seamless appearance. Dental implants require sufficient bone for support. If you have been missing teeth for some time, it is likely that a bone grafting procedure will be needed to complete the procedure. If this is not attractive to you or if it is not an option due to advanced bone degradation, we can discuss all alternatives during your initial consultation. Oral hygiene is of critical importance as the dental bridge relies on the neighboring teeth for support. A strict regimen of brushing and flossing will keep the bridge and surrounding teeth clean. If you have difficulties maintaining a routine, we can help you create one that makes sense for your health during your next routine visit. While all solid daily habits include brushing and flossing, there are minor variances needed for individual smiles in order to optimize their health and appearance. 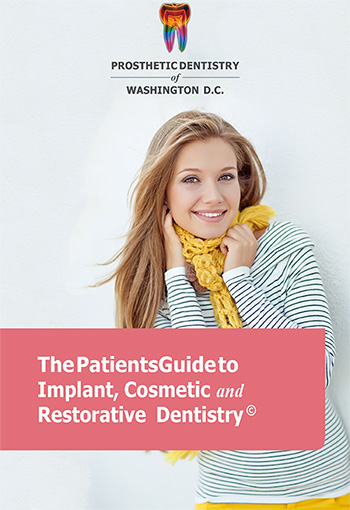 Please call Dr. Marlin Gerald at 202-851-8016 to schedule a dental bridge consultation at Prosthetic Dentistry of Washington D.C. Dr. Marlin serves patients in Bethesda, Arlington, and nearby areas of Maryland and Virginia, as well as visitors from across the country.